I took this picture while on a field mission with the predecessor of STAN Solutions, on a joint project with the Naval Postgraduate School. 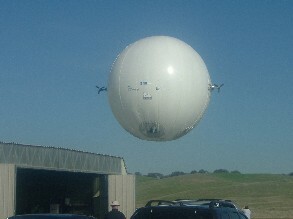 It is a spherical dirigible, which we used to model a satellite for over-the-mountain communication. What was cool was hearing, on AM and FM radio, about UFO sitings.